[패턴 영어회화] A + is the best choice for + ~ . A가 ~에는 최고지. A + is the best choice for + ~ . Samkyetang is the best choice for lunch today. KTX is the best choice for getting to Pusan. Silk is the best choice for sleepwear. A minivan is the best choice for city parking. 굿모닝팝스가 영어를 익히는 데는 최고지. GMP is the best choice for practicing English. Red is the best choice for a necktie. Watermelon is the best choice for a snack. Chocolate is the best choice for a gift. 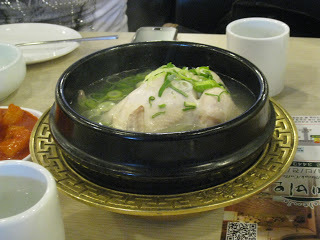 A: Samkyetang is the best choice for lunch today. B: My mouth is already watering. A: A minivan is the best choice for city parking. B: I’ll stick with public transportation. 난 대중교통 쪽이 더 좋아. A: Chocolate is the best choice for a gift. B: It’s great for any occasion.